Honestly, I am addicted with this recipe. It's super easy, super yummy and super fast too. And also healthier than regular pork bacon. This recipe is great to entertain your family and friends, I guarantee they will love it! Heat the broiler. 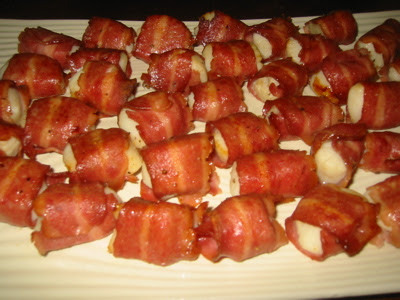 Wrap each sea scallop in a half slice of turkey bacon and secure it with toothpick. Cover a baking sheet with foil. Place the turkey bacon wrapped scallops onto the baking sheet. Season them with salt and pepper, and drizzle them with olive oil. Put them under the broiler. After 8-9 minutes, transfer them to a plate and discard the juice from the scallops. Put them back to the baking sheet, turn it over and let them cook for another 8-9 minutes, or until they are crisp.